In an ideal scenario, caregivers would like to be able to share health information with one another. Driven by a need, if a patient were to shift to a new caregiver, the later would at once like to have access to the medication, lab reports, discharge summaries etc. This would only be possible if electronic health records could communicate with each other through an information exchange infrastructure. This is not only going to improve the quality of care but also increase the efficiency levels besides saving healthcare costs. The current scenario is far from ideal because of lack of interoperability of EHRs and exchange infrastructure. 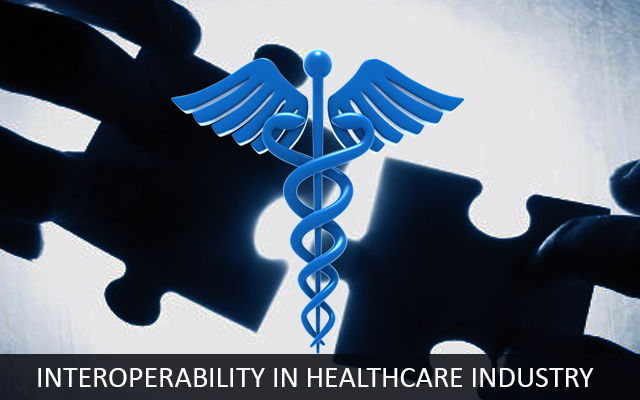 For the Healthcare industry to take the giant leap and reach the state its leaders envisage, a break-through on interoperability is a must. Unless handled on a priority basis, this a stumbling block which every big IT initiative in this industry will hit at some stage. It is only by bringing in fluidity in the information flow that the industry stands to draw the biggest benefit. Otherwise, the healthcare software development services industry cannot expect to bring about a transformation by just working in an efficient manner in silos. Real benefits will be harvested only with seamless data exchange. Collaboration is imperative and so is safety and security of data that is shared across the industry. It will not only enable providers to manage their workflows better in their clinics but also make it possible to send and receive healthcare related data across disparate EHRs used by various other healthcare setups. To make interoperability a reality, massive amount of work needs to be done in a synchronized manner. Public-private coalition holds the cue here and the pace of adoption depends on strict adherence to the agreed upon national standards with no allowance made to variations. It is only when disparate EHR products and HIEs agree to strictly follow the same standards that the capability can be achieved. States being awarded grants to setup Health information exchanges is definitely a step taken in the right direction since it will provide the backbone for interoperability. There are concerns however shared from some of the stakeholders who feel that too much of emphasis on regulations while setting up or running HIEs will only jeopardize things more. The key areas to be handled here include Patient matching and finding solutions to the variances of safety and privacy rules followed across states. It thus calls for innovative approaches to work around these issues rather than strict adherence to policies which might eventually result in deadlocks. This is an initiative which moving forward is expected to draw in more vendors, especially the ones which intend to be in the business for the long haul, since there is no future without interoperability. The most important outcome of such an initiative is that it will expedite the process of drawing a map to reach the destination in an efficient manner. This also will bring about a change in the landscape for vendors whose products will now have to compete in terms of their adaptability towards cross-vendor exchange and interoperability. The impetus provided by the Federal grant might have got the adoption of HIEs rolling but moving forwards these organizations will have to figure out ways of being financial afloat beyond the grant money. On the other hand the adoption of HIEs will pick pace only if the standards and certifications are concrete and get defined such that interoperability is completely achieved. It would result in any EHR product receiving data to be able to work on it straightaway. We provide Healthcare application development and Healthcare software testing services. If you would like to talk to one of our software testers or one of our certified healthcare software programmers, please get in touch with us at Mindfire Solutions. This Post was posted in Health Care and tagged Clinical software development, Customize EHR system, develop clinical information management systems, develop computerized physician order systems, Develop Electronic Health Records, develop hipaa compliant patient portals, develop medical billing software, develop medical e-learning solutions, Develop medical practice management software, Develop medical practice management system, EMR EHR Software development, healthcare software development, healthcare software integration, healthcare software maintenance, hire healthcare software developers, internet-based medical billing software development, iphone healthcare app development, Medical Software development, mobile health app development, mobile healthcare application development, offshore mhealth development, outsource mhealth development, web-based practice management system development. Bookmark the permalink.